It was late afternoon by the time I’d unpacked, assembled my bike, and was ready to roll. Keish and I rode 33 miles. It was a torture-fest. 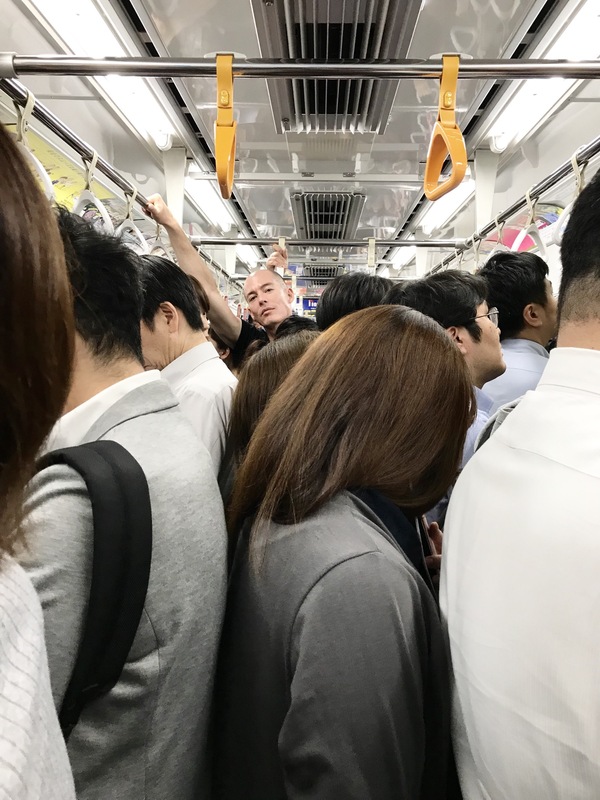 The heat, the lack of sleep, and the transition from indoor training to outdoor riding created a perfect storm. We rode out to Donkey Crossing Hill, and we turned around. The headwind on the way back to Kailua-Kona was aggressive. 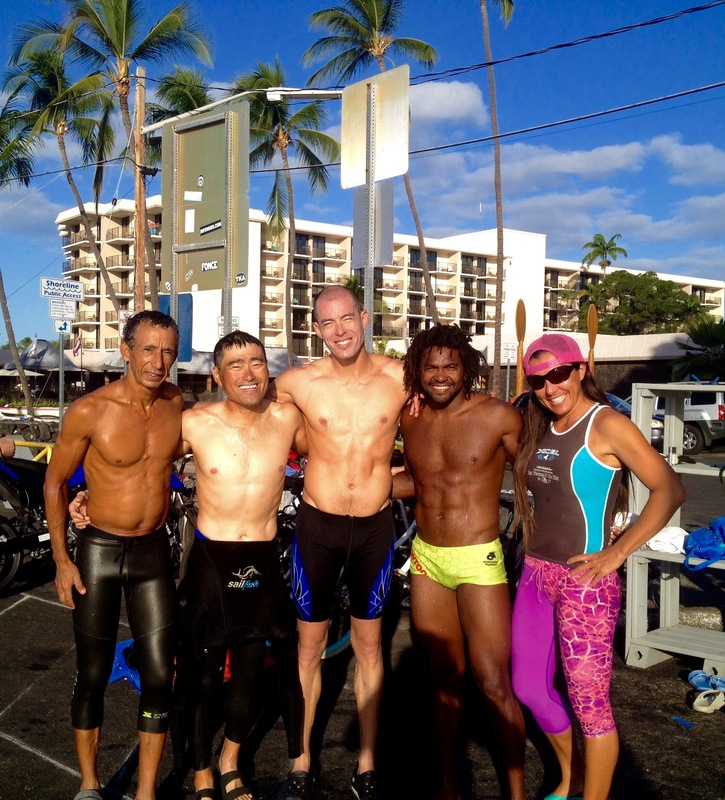 I was reminded of the Kona ’14 Training Camp and the ’14 Ironman World Championship. 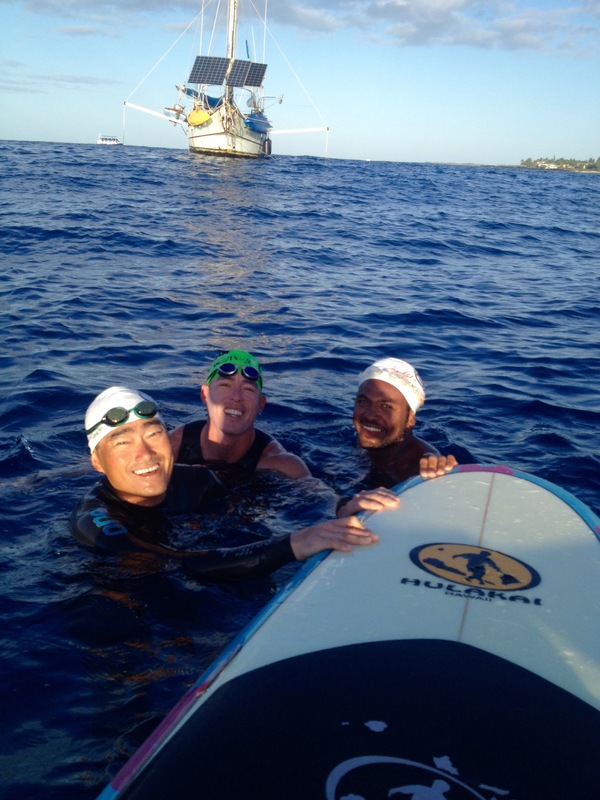 Wednesday morning brought the sunrise and a 1.2 mile swim from Dig Me Beach, home to the IM World Championship. Wetsuit-clad and ready for the colder, Kona-winter water, we swam. The swells pushed, and the current provided some underwater jostling. There is a turbulence that is foreign to the pool swimmer. It is a strength swim here. You muscle through the catch and pull, without nearly as much glide. Finesse is replaced by will. You sight regularly off the boat in the distance, or the radio tower on the shore. You will yourself toward it while occasionally keeping your head down long enough to see yellow fish shimmying past. Next was our ride to Hawi. This would be my first ride of this distance since December 1 (Ironman Cozumel). The way out had me feeling like a natural. I was Robert Redford on a road bike carved out of a carbon fiber tree. I was ready to shatter lights. It was hot, I went through 4 bottles, and I felt strong. It’s funny how little things, like the wind, can wreak havoc upon your mental state. When we rode back from Hawi, just the 17 miles from Hawi to Kawaihae were demoralizing. The headwind was among the most challenging I’ve faced. I was going all out, downhill, at a speed of 12mph. I should’ve been going 30-40mph. This section was supposed to be free speed. The mental games began: just make it to the next mile marker. Just make it through this section of crosswinds. Just make it to that palm tree. I hoped the winds would relent when we reached Kawaihae and made a right turn onto the Queen K.
They didn’t. If anything, the winds increased. Keish, on his new P5, opened up a gap. I, on my road bike, dug as deeply as I could to minimize it. We’d averaged just under 24mph out to Hawi. Now I was happy to see 14mph on my Garmin. Power numbers were still good, but my mental energy was dissipating. A heavy wind is like a funhouse mirror that shows you a part of yourself that you rarely see. I saw a distorted desire to quit. Had a mind reader been nearby, there would’ve been a van parked on the side of the road that could deliver me in an air-conditioned chamber back to Kailua-Kona. But the van never arrived. And I persisted, breaking the final 34 miles into chunks: Waikaloa, the dump, Donkey Crossing, Scenic Point, cemetery, airport, Natural Energy Lab, Costco, marina, Sports Authority, right turn to home. Sensational. 9.5 hours of uninterrupted sleep. Yesterday I’d been kicked in the teeth. I was dejected. I’d considered throwing in the towel. But I got up this morning. Swam 1.2 miles, guided by Annalee Akagi on a stand-up paddleboard. It was me, Keish, Sal, and Samuel. I felt great! Even though I was sore, and even though I had mental whiplash from yesterday, I swam faster (in a swimskin) than I did the day before (in a wetsuit). There were fairly large swells today, which can be seen in this video. 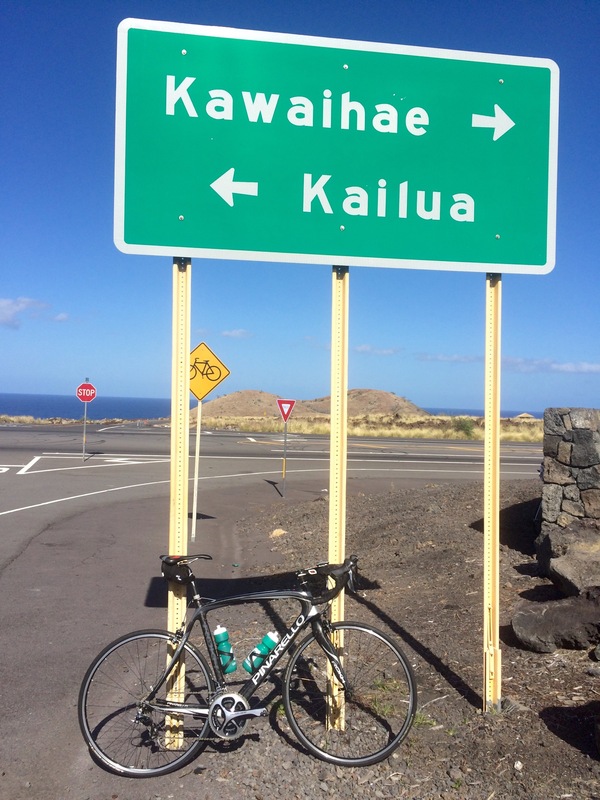 When Keish and I mounted our steeds to knock out another 107-mile ride to Hawi, I was skeptical. Given yesterday’s performance, I didn’t know how I’d fare. And for the first 30 miles or so, my naysaying mind did not disappoint. But then something happened. Due, perhaps, to endorphins or serotonin or dopamine, or perhaps due to a small taste of success in making it 30 miles into a ride that spit me out the day before, my state changed. I began to feel cautiously optimistic. There wasn’t as much of a tailwind going out, but ideally there’d not be as much of a headwind going back. Of course, this is an island. So the winds change. Often. By the time we reached Nakahara Market in Hawi, I allowed myself a quiet celebration while I quickly downed a turkey sandwich. It’s so funny. Yesterday I was gutted. My power was at 215 watts, and we completed the ride in 6:02. Today I held back a bit, riding at 188 watts, and we completed the ride in 6:05. So much less power output. So much less energy expended. (And we only went 3 minutes slower). Sure, there was also much less wind. But when we rolled into Keish’s place, I felt good enough to go for a quick run. It was only 2 miles along Ali’i Drive, but it was an enormous victory for me. The swim was good, but the effort to keep my legs from sinking while I swam compelled me to consider two words: cumulative fatigue. And once we hopped onto our bikes, I was compelled to consider one word: aerodynamics. There was a headwind. 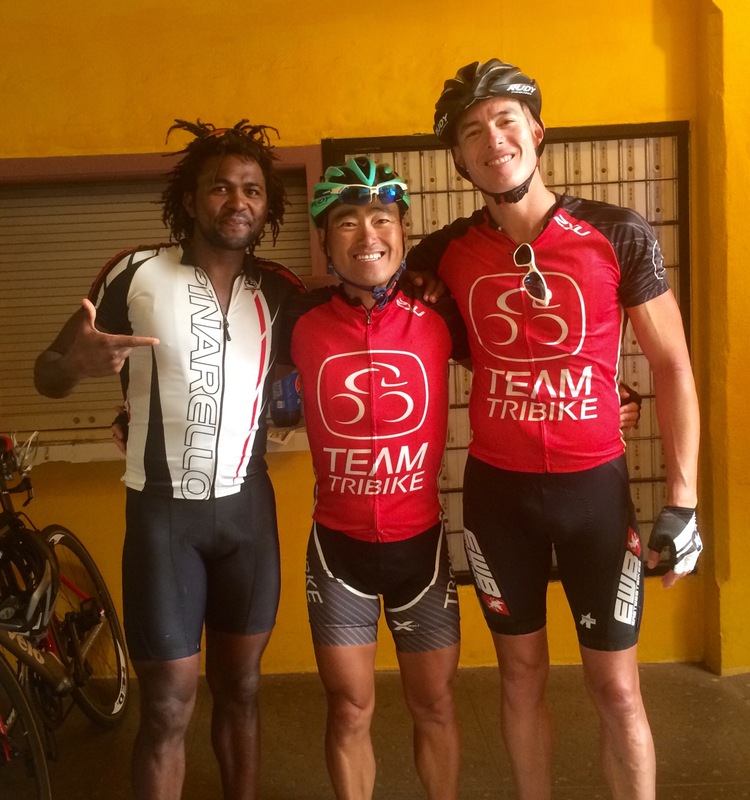 Sal, Samuel, and Keish were on their tri-bikes. I was on my road bike. While I was pushing fairly high power numbers just to stay in their draft, they appeared to be cruising. They started to pull away near Waikoloa, and a gap opened. I was struggling, in a headwind, solo. The funny thing is, if I consider my watts, I was riding well. But that’s another problem. When your self-evaluation is relative to how others in your group are doing, you start to question if you’re really riding well, or if you should be going harder . . . and faster. So it is fun. But it’s a sadistic kind of fun. It’s the difference between touring and training. If it were bike touring, we’d be stopping to see the Humpback Whales or taking photos of waterfalls. But bike training is a sufferfest. And doing so on the Big Island, with the heat in your mouth and the winds in your face, fighting your way over 107 miles through black rock, through lava fields . . . that is BRUTAL. On our return, as we bulldozed through a Queen K headwind, we saw someone riding on the other side of the highway. It was Jose Graca. I was hoping to see him, as I knew he’d left Brazil for the year in favor of training on the Big Island. As per Ironman All World Athlete rankings in the 40-44 Age Group (out of 24,783 athletes), I’m ranked #3. Jose Graca is ranked #1. He looked strong. We finally made it back to Kailua-Kona. 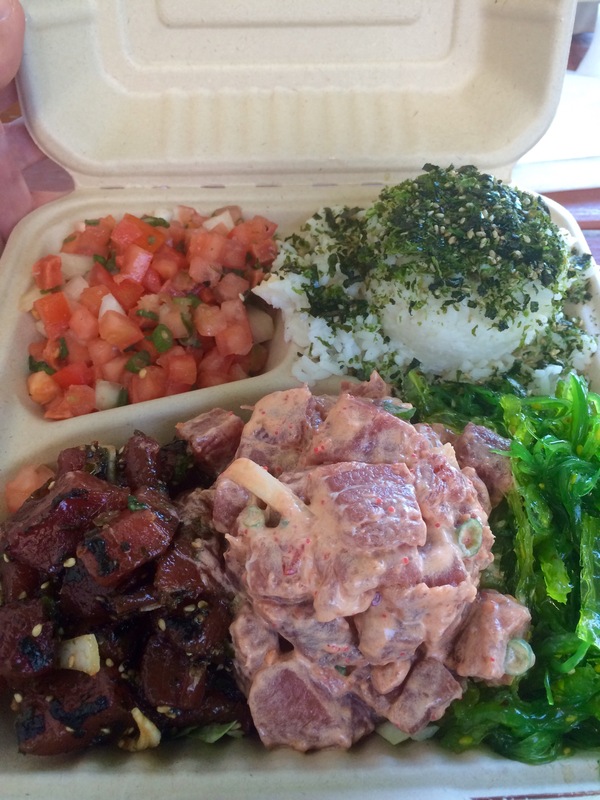 And then after a change of clothes, the reward for our effort: poké at Umeke’s. I like to order the Big Boy. 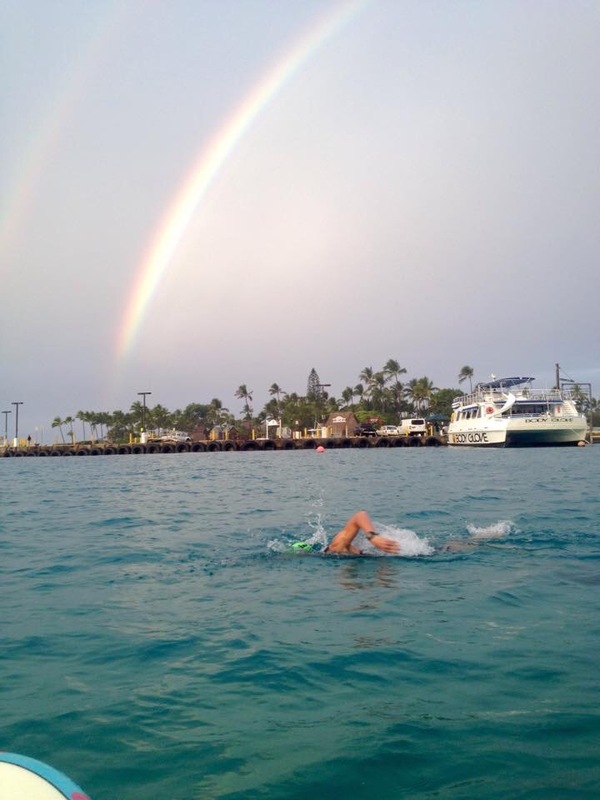 Today began with a 1.2 mile swim from the pier. My legs were heavy, and I experienced some shortness of breath, very likely due to 20 hours of fairly heavy training in the last 3 days. I still swam hard, but I was one minute off the pace I’d been hitting daily. We thanked Annalee for leading us out and back, and then it was time to ride. People say things like, “Wow, you’re going to ride to Hawi again?” And to some people it would seem boring or repetitive. Sure, it’s the same route. And sure, it’s 107 miles. 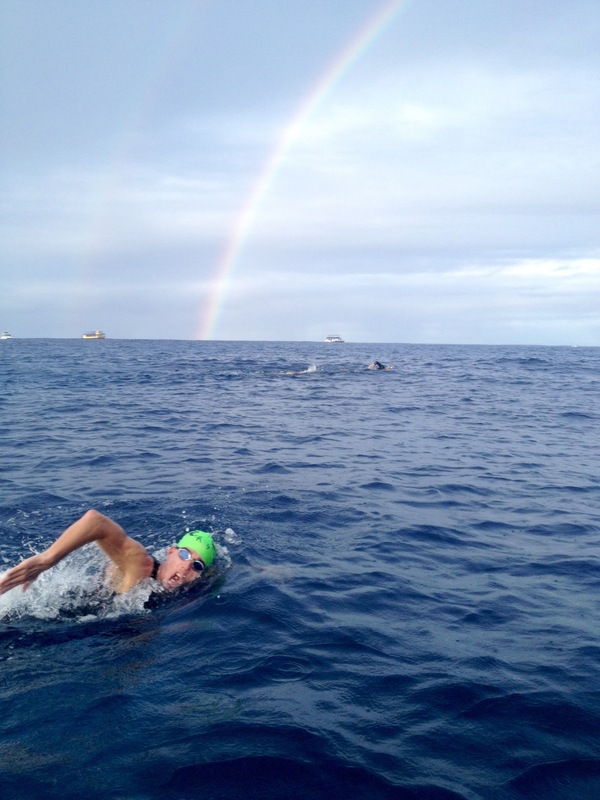 But as Keish noted about bike training on the Big Island: “Everyday’s a different ride”. And today did not disappoint. The first 54 miles we faced a massive headwind. It’s one thing to ride flats into the wind, but the climbs up to Hawi, which can be tough with a tailwind, are especially laborious when pushing against Madame Pele’s wrath. By the time we arrived in Hawi, we’d averaged 16mph. Just three days ago, on Wednesday, we averaged 23.5mph. That is a huge difference, especially when similar power numbers were hit on both days. We re-fueled at Nakahara Market, and then hopped back onto our steeds to take advantage of a forceful tailwind before the winds shifted (it’s not unusual to have a headwind in both directions when training on this island). The tailwind held strong from Hawi to Kawaihae, propelling us just under 40mph on the descents and helping us hold just under 30mph on the rollers. The section from Hawi to Kawaihae is close to the ocean, so you can see Humpback Whales expelling air and doing big side-bend belly flops. It’s exciting, but not as exciting as a tailwind. We bridged the 17 mile distance between the two towns in record time. And as we turned onto the Queen K, there was still a tailwind. Of course, in order to truly test yourself, a tailwind can only last for so long. Soon, around Waikoloa, the tailwind became a crosswind, and the crosswind became a headwind. You’re now in a cauldron of lava rocks and hot air. And because of the headwind, you have plenty of time to stew in it. The water in your bottles is no longer cold. Your lips are chapped. And tiny blisters have formed along your wrist and forearm, as the sunblock must not have been evenly applied. But then you grow up. You realize that the closest you’ll ever come to swimming with big fish is in a controlled environment, perhaps in a protected bay, a large pool, or an aquarium. And it’s fine, I suppose, as even Peter Pan needs to become an adult someday. But then you have a moment like I did this morning, where you swim with wild Spinner Dolphins. There are hundreds, but you see ten . . . maybe fifteen. They’re swimming under you, and you can see them because the water’s so clear. You’re half a mile from shore, looking through your goggles into a turquoise blue. The dolphins are so fast, but they slow down for you. Here are two of them, just cruising along in this video. They shimmy, dovetail, and show off their silky white bellies. And it could be a trick of the light, but one seems to be smiling at me. I quiet my stroke, but I pull hard so I can glide. I’m now fully underwater, on my side. I’m gliding through the water, inches away from four dolphins who keep changing positions but stay just long enough to say, “Hey, we know you’re there. And we enjoy swimming with you”. This continues for another couple of minutes. I am 7 years old again. I am awe-struck. I am Aquaman. Play time is over. The dolphins dive, and I begin my swim to shore. I wasn’t planning to see dolphins today, and I wasn’t planning to feel like a superhero. But sometimes life surprises you. Next on the docket was a ride. 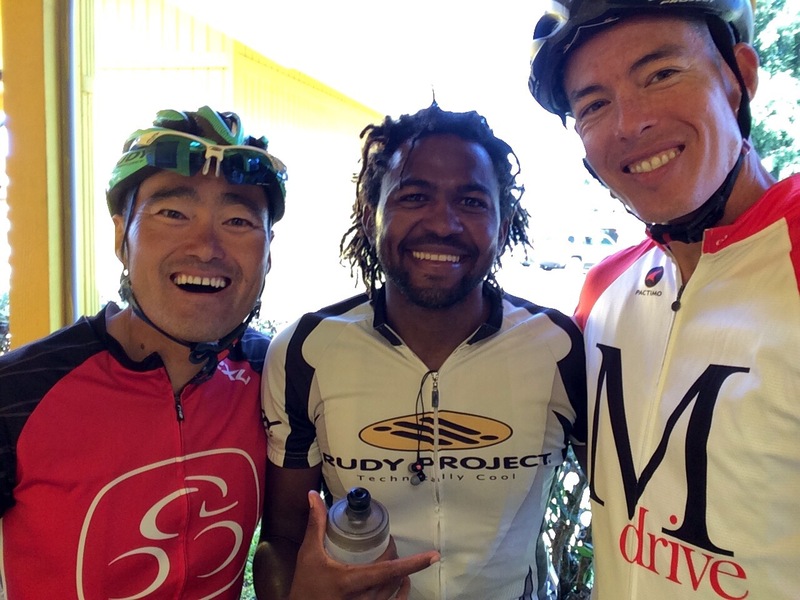 We’d planned a 90-mile bike to Waimea. This shouldn’t have been too Herculean a task, but unlike Keish, I was tired. We’d ridden to Hawi the last four days in a row. That’s 428 miles. Hard miles. Long miles. Today was our final ride of this training camp. It would culminate in a 10-mile climb to Waimea. But as we rolled along the Queen K, only 6 miles into a 90-mile day, I was falling asleep at the wheel. My eyes were heavy. It’s just so hot out there. And post-apocalyptic. I tried to have energy, but I was sleepy. It didn’t help, of course, that I kept repeating to myself “I’m so sleepy. I want to sleep. I’m tired. I need to go to sleep”. We define ourselves by the words we use, and these affirmations were not going to reinvigorate me. I started to negotiate. I told myself to finish strong. But I questioned what was better: finishing strong or finishing alive. Finally I decided that we’d turn around at the Scenic Point, approximately 20 miles into the ride. That’d give us 40 miles. But Keish was planning on 90. So I’d have to simply explain that I’m tired, and I’d like to turn around. Simple as that. No big deal. Everyone gets tired. As I was rehearsing my “Here’s why I need to quit” speech, we were a mile away from the Scenic Point. Keish and I were riding side by side, but we hadn’t said a word for the past 18 miles. Then he broke radio silence by saying, “I’m looking forward to eating a Char Siu Manapua at the top of Waimea”. I simply foreshadowed the speech I was about to deliver by saying, “I don’t think I’ll make it to Waimea. I can barely keep my eyes open”. Keish, in his brilliance, kept it very simple. He said: “Maybe you’re not going hard enough”. Even in my hot, fatigued, pillow-desiring state, it occurred to me that he might have a point. I decided to get off my saddle and ATTACK the final ascent to the Scenic Point. I mashed the pedals until my lungs started to burn. The bike started to swing left to right, like a pendulum. It was clumsy. It was ugly. But momentum was stirring. By the time we crested the climb, I was dancing on the pedals. And instead of making a left into the Scenic Point parking lot, I decided I’d go hard to Waikoloa before breaking the news to Keish. Of course, by the time we reached Waikoloa, I’d changed my state. There was no way I was turning back. I felt great! We reached the end of the Queen K, made a right to Waimea, and Keish told me he normally does this climb in 1 hour 10 minutes. It’s a 10 mile climb with 2,500 ft. elevation gain. We started the climb with urgency. It was hot. It was steep. And there was sweat. But I was alive. We surged up the ascent, and when we finally reached mile 9, Keish said we might break an hour. So he sprinted. Of course, I followed suit. It was, in many ways, amazing. My legs were so heavy. So sore. And just 90 minutes earlier I was rehearsing my “Let’s turn around early” speech. Yet here we were, sprinting. Going all out to reach Waimea in under an hour. As we pulled into the gas station, which I’m told marks the end of the climb, the time on the clock read 58:03. Not bad. Not bad at all. After refueling, we descended without much pomp and circumstance. And then we rode the final 34 miles back to Kailua-Kona. We rode well. We were strong. And it was another victory over self. It was another deposit into the “You can do great things” piggy bank. This training camp was a success. I arrived fairly strong. And I am leaving much stronger. It’s part of a commitment to build something big in 2015.